An outside view of Aspen Skiing Co. employee tiny home housing. A prototype of Aspen Skiing Co.’s second generation of tiny homes is catching eyes at Buttermilk. With Skico’s job fairs starting up for this season, the company has parked a model home there temporarily to show to prospective employees. 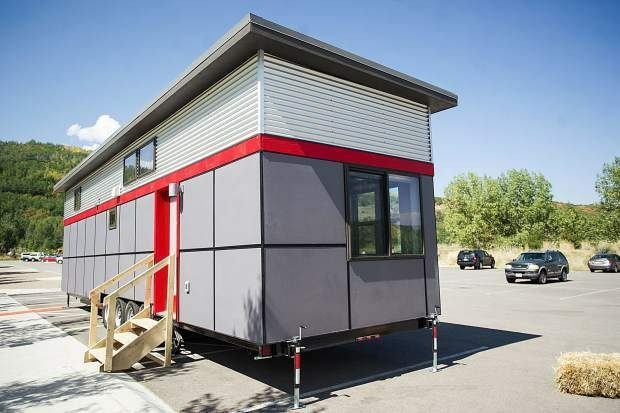 Given last year’s tiny home success, the affordable-housing option near Basalt is expected to be a big draw again this year. After it bought six tiny homes last year from Sprout Tiny Homes of Pueblo, Skico ordered 34 additional larger, three-bedroom models for this ski season. Skico project manager Philip Jeffreys said Tuesday the units are exclusively for seasonal workers because so few affordable options exist for them. No one is required to live in the housing, but seasonal workers were interested last winter because it’s among the cheapest options. The units capture people’s attention. Jeffreys said it is difficult to work at the unit as passersby in the Buttermilk parking lot stop to check it out because of the growing fascination with tiny homes. Seasonal workers’ feedback last season said that the units need to be even less expensive. Skico charged $600 per month per person, including utilities, for the six original tiny houses, which each slept two people. The new models are configured for three people so the rate will be reduced to $450 per person, Jeffreys said. “The big change is the size,” he said. Last season’s models have a 300-square-foot ground floor with two lofts on either end of about 100 square feet each. Those units remain in Skico’s Aspen Basalt Campground in the midvalley and will remain in the rental pool. This year’s 34 new models have a 400-square-foot main floor, with two lofts on either end, but the larger space allowed the addition of a ground floor bedroom. The price stayed at about $100,000 per residence for Skico. Sprout Tiny Homes was able to offset the increased expense in building bigger units by ordering in bulk. Another big change is storage. Cubbyholes were added here and there, such as shelving under the stairs to the lofts. Lockable storage spaces were added for each of the three residents. Skico also is remodeling the office and laundry facility at the campground to make it more inviting and functional. It will include a lounge that will allow workers to get out of their tiny homes, if they so desire. “On the comfort side, we’re making changes to the movement of air,” Jeffreys said. Skico worked with the manufacturer on systems that circulate fresh air into the lofts. There also will be infrared radiant heat in the floors, including in the lofts. The 34 units will be relocated to the Aspen Basalt Campground by mid-November. Skico bought the 6.6-acre campground in 2008, when it operated as a KOA. There were 20 to 25 residents who lived there year-round and paid $750 per month for a space and utility hookups. Skico initially told residents in August 2015 they would have to move out the following spring, but that deadline was extended. Residents must be out the Tuesday after Labor Day. All but two residents have relocated, Jeffreys said. Skico offered financial incentives of as much as $3,000 for residents to relocate early. The tiny houses are considered RVs because they are built on a chassis with wheelers and they are licensed. Since they are not on a permanent foundation and will be located in a campground with proper hook-ups for water and sewer, the residences don’t have to go through Eagle County’s land-use review process. The addition of the 34 units — 102 beds — boosts Skico’s inventory of beds that it owns by about 20 percent, Jeffreys said. The tiny houses have an expected span of 30 years of use. Nevertheless, Skico still estimates it is short more than 500 beds. Skico is looking at a number of avenues to help address its shortage, he said.